Nikko is a small city, with no real attractions except, of course, the shrine area. 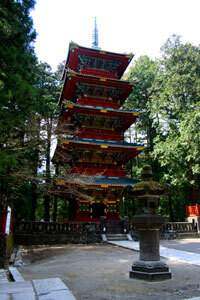 The shrine area contains Tosho-gu, and other heavily-carved wooden structures. We arrived off-season, but appartly Nikko gets very busy with tourist at other times, so do come early (it opens at 8am, I believe). 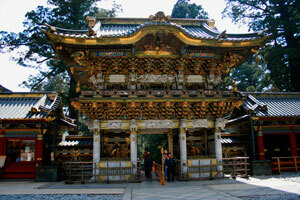 Nikko is an extremly worthwile day-trip from Tokyo, if you have a bit of cultural interest. If you have time, say 1 to 1.5 days, do also try to visit the Kegon Falls. 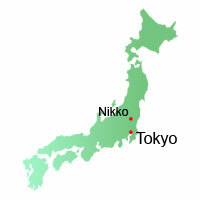 We tried Nikko twice. The first time, after visiting Matsushima, we arrived too late. Most of the shrine complex was closed. So we went to Tokyo. 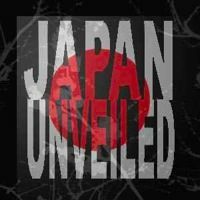 We had booked a room in Tokyo, because it is sometimes very difficult to find a room there. We woke up early the next day and took the trian back up to Nikko. We first visited Kegon Falls, and then went back to Nikko. 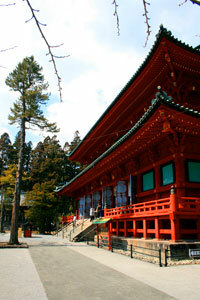 From the station in Nikko you can take a bus up a gentle sloop to Nikko's shrine area. We decided to walk however, as it is a small walk. Just before entering the shrine area we passed the red bridge, Shin-Kyo. 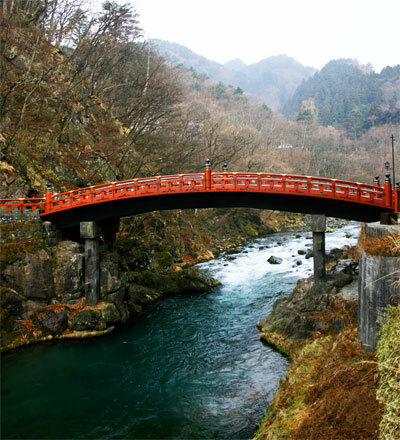 The bridge is said to be on the spot where a monk, Shodo Shonin, was carried over the river by two serpents, before settling in Nikko. You could choose to pay to walk over it, but instead we decided to keep the money and walk on the modern bridge right next to it and have a good look at the old bridge. After the bridge it is a relatively steep climb to the main shrine complex. There we arrived first at the Rinno temple (Rinno-ji). 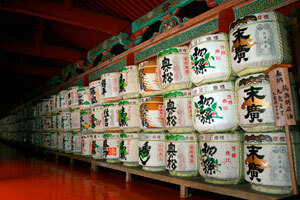 This temple was founded by Shodo Shoni, and contains the sambutsu-do, the three buddha hall. Behind a sort of paravent room divider are three big gold-colored statues, one of them the Kannon Bodhisattva, goddess of mercy. This was a pretty amazing sight. 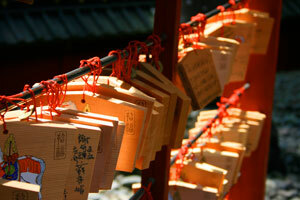 We then walked towards the main shrine complex, the Tosho-gu. On the way we passed a 5 story pagoda, and two statues of guardians (Deva Kings) who guard the shine area. 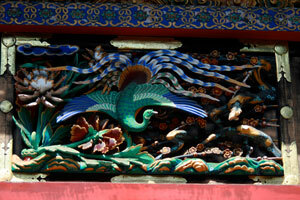 Inside the complex, we were immediatetly greeted by two buildings that are intricately woodcarved. Straight ahead was a storehouse with wildly unnatural elephants carved into it. 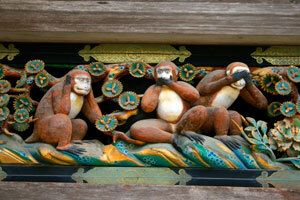 The other, to our right contained the famous carving of the three monkeys, "see no evil, hear no evil, speak no evil" (mizaru, kikazaru, iwazaru). This is the original carving that made this saying widely known (although the saying is likely older than this carving). We were still in for a real big treat. We next passed the a font where worshippers cleanse themselves before prayer, and when we turned the corner, and walked through a torii and up a flight of stairs, we were confronted with such extravagant carvings that you did not know anymore where to look. So much detail. This is the Yomei-mon, Yomei gate. We probably spend most time around this gate. After passing throught the gate, we entered a small court-yard, with on the left a small display of mikoshi (shrine that are portable, and taken out for special celebrations in May and October). 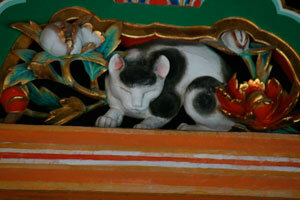 Other buildings in the enclosure are the Main hall, the Haiden (for worship), and the Nemuri-Neko. This last building contains a lot of drums used for sake storage, but it is more known for a carving of a cat which is said to be extremely life-like. Eventhough you can get a good view of it, with a telelens, we decided to pay for entrance to Ieyasu's tomb, and the possiblity to see the cat from up close. Unfortunately the cat was a bit of a disappointment, in my opinion. It did seem somewhat more life-like than other carvings, but not by much. The walk to Ieyasu's tomb was relatively easy, without much to see except a lot of trees, and, in the end, a rather subdued tomb of Ieyasu. Nevertheless, an enjoyable walk. 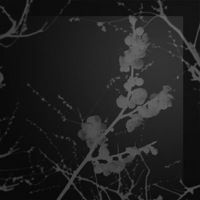 We quickly walked to Futarasan-jinja and Taiyuin-Byo, two smaller versions of Tosho-gu, the fist devoted to the mountain Nantai (and founded by Shodo Shonin), the second devoted to Ieyasu's grandson, Ieymitsu. Unfortunately, we had little time to absorb the beauty of these buildings, because the trip to Kegon Falls had taken quite a bit of time. We had to go back to Tokyo already.